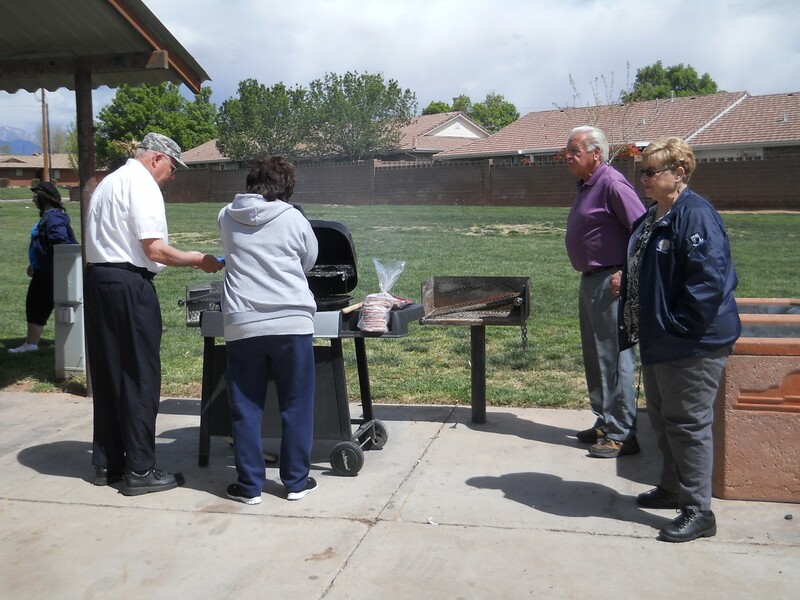 ST. GEORGE – Vietnam War veteran Raymond M. Black was joined by friends and family at J.C. Snow Park in St. George Saturday afternoon for a barbecue bidding farewell to the 71-year-old who plans to set out in 10 days, riding to Florida on a scooter adorned with flags and placards. 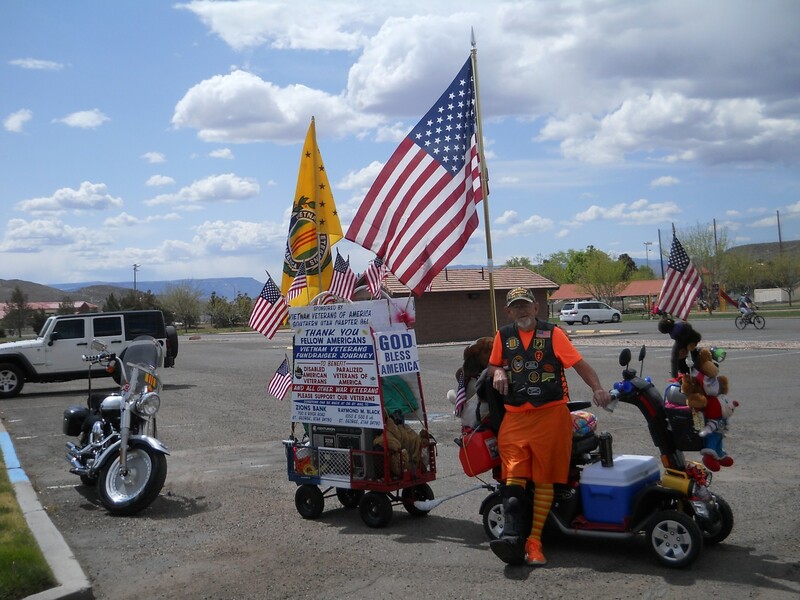 His goal is to raise awareness for POWs and MIAs and raise funds to help Veterans nationwide. Dressed in an orange shirt and shorts, black-leather vest embellished with colorful patches, knee-high yellow and orange striped socks and a baseball cap in army camouflage print, Black placed a hot dog on his plate and enjoyed the company as he told of his plans to depart from home around 6:30 a.m. on April 15. His traveling style is slightly unorthodox. Black will cruise over 2,000 miles on his rechargeable Pride Pursuit XL Scooter adorned with 14 American flags, one Vietnam-American flag, stuffed bears (one of them named “Freedom”), a cooler filled to the brim with root beer and a Utah Jazz stuffed monkey. Black’s cross-country scooter cruise is done in association with the Vietnam Veterans of America Southern Utah Chapter 961. His journey is expected to take about three months and will weave through northern Arizona, New Mexico, Texas, Louisiana, down the coast of Mississippi, Alabama, and on into Florida. From there, Black will visit with a few friends, ship his scooter back to St. George and fly home. Black grew up in Landing and served in Vietnam during 1966-67. He has six children, 33 grandchildren, and four great-grandchildren. His wife passed away about a year and a half ago, Black said, and he realized that he has the time and money to make the trip and has nothing better to do over the summer. Checking into hotels along the way is not on Black’s agenda. Instead, he plans on camping underneath the moon inside his own tent which he has packed inside his wagon along with a sleeping bag. In the beginning, family and friends were concerned about Black traveling across country on his scooter, he said, but now they are mostly excited for him. But they still want to know if he is worried about any trouble along the way. It’s really important for Black to go out and do this trip, it will give him a lot of time to think, a lot of time to work through all the things he’s been through, but more importantly to help him feel significant, Solomon said. The more attention he gets the more complete his life will feel. As far as the scooter keeping up with his itinerary, he said he has two spare tires and the wheels on the wagon are all rubber. Donations can be made at the Zion’s Bank in St. George or you can mail them to 1050 E. 500 S. Apt. #6, St. George, Utah, 84790. He left Nice, AZ this morning. He has made it to Groesbeck, TX.